A couple of years ago ARM approached Inveneo, a United States–based information and communication technologies for development (ICT4D) nonprofit, to answer the question “What are the main challenges related to the deployment of technology hardware across the developing world?” By understanding the challenges, we believe that ARM and its business ecosystem can learn how to develop better products for this emerging market. Surprisingly, given the market size and the global interest in ICT4D, this study was the first research of its kind. The US Agency for International Development (USAID) was naturally interested in the topic and joined ARM in supporting the research, but it also fitted a wider USAID goal—that of encouraging the private sector to help tackle international development issues. This chapter looks at how both social and commercial benefits might be achieved by helping to include the developing world in the ICT revolution. Human factors, software, services, social influences, and many other ICT4D considerations have been studied repeatedly, but the impact of hardware has been largely ignored. This chapter’s principal contribution is to address an overlooked, under-discussed—and therefore ill-addressed—feature of ICT4D: the technology itself. The lack of attention paid to the actual technology and the role it plays (or can play) in fostering inclusive growth and innovation has been detrimental to development-related outcomes, particularly because not paying attention to these elements results in the promotion—as opposed to the easing or eradicating—of inequality. If the needs, requirements, and realities present in the developing world are taken into consideration, ICTs that promote more inclusive growth is the result. Electricity/power/energy. The presence of low-power hardware with long battery life is crucial in an erratic power supply environment rife with electrical spikes, swings, dips, blackouts, and brownouts. Cost. Striking a balance between lowest cost and solid, reliable, functional technology is essential. Environment. Products need to be designed with durability in mind, including resistance to water, humidity, dust, dirt, and extreme heat. Some screens are difficult to read in direct sunlight, so particular kinds of screens are needed (e-ink screens are ideal). Connectivity. The more connected the network is, the more valuable it is. The main method advocated for connection is Wi-Fi. Maintenance and support. Technology that cannot be locally maintained, supported, and repaired is not sustainable. Transportation for repair, maintenance, and support is expensive. These hardware priorities should be put into the context of a much longer list of social factors to be considered. Unlike the hardware, however, these social factors benefit from a very large body of academic research. Gari Clifford combines academic credentials with years of practical experience rolling out affordable health technology in developing countries. He has some insights into the social needs that must be combined with appropriately designed hardware if real benefits are to be achieved and sustained (Box 1). the ability for the technology to be self-sustaining and enable a business model to allow competitive use, without creating a monopoly or a concentration of power. The above considerations require a multidisciplinary team of anthropologists, engineers, economists, and specialists (such as doctors). In particular, it is important for anthropologists to work in the field with the engineers to observe how the technology is used, and for the engineers to use the results in an agile development approach. This implies having multiple iterations of the product so its development adjusts according to the needs assessment and field trials. The issue of inequality is an important one. In their seminal article “The Economics of ICTs and Global Inequality,” Heeks and Kenny (2002) put forth the argument that technology has been a force promoting inequality and divergence rather than equality and convergence. It is true that technologies that exacerbate inequality far outnumber those that ameliorate it. This need not necessarily be the case, however. But it will take a concerted, committed effort to ensure that the positive potential of technology is achieved. A gap may still exist between theory and practice, however—both practitioners and scholars bemoan the contrast between ICTs’ potential and their relatively modest measurable impact. Part of the answer may be that technology is obviously not the sole driver of inclusiveness. Recent UN and Organisation for Economic Co-operation and Development (OECD) publications have identified the need for well-designed and well-implemented social and economic policies to work alongside technology to promote innovation and inclusive development.8 A targeted focus on STEM (science, technology, engineering, and mathematics)-related education is one example. Both the UN and the OECD emphasize the need for public and private sectors to join forces to address the challenges presented by the gap between theory and practice. This theme has been taken up by the major international donors. The program Grand Challenges—a family of initiatives with partners that include USAID, the Bill & Melinda Gates Foundation, and the UK Department for International Development, among others—started as an attempt to spur innovation and private-sector engagement; an additional $50 million was committed to this program in October 2014 by the various partners. Their most notable Grand Challenge to date is the initiative Saving Lives at Birth. This initiative seeks to promote innovative technological and operational approaches across three childbirth-related areas: new scientific and technological approaches to prevent, detect, or treat maternal and newborn problems at the time of birth; service delivery models to provide high-quality care at the time of birth; and ideas for empowering and engaging pregnant women and their families to practice healthy behaviors and be aware of and access healthcare. More than 4,000 innovators have responded to the initiative and over 135 innovators are currently receiving financial support that totals US$220 million. Ideas have come from all over the world—from an Argentinian auto mechanic, world-class scientists, and entrepreneurs to in-country nongovernmental organizations and established multimillion-dollar research institutions. In 2014 a student team applied for funding from Saving Lives at Birth for their new nonprofit health technology organization, SimPrints, which awarded them a grant to launch a major pilot in Bangladesh (Box 2). SimPrints is interesting because it emerged from an understanding of a need in global healthcare, took an iterative approach to hardware development that could address this need, and had to discard many preconceptions as a result. Driven by poverty and the promise of opportunity, the massive rural migration to Bangladesh’s urban slums has created daunting challenges for community health workers like Nisita. Nisita is responsible for visiting almost 300 households a month in Korail, a major Dhaka slum. Many of her patients have similar names or names with multiple spellings, they might not know their exact date of birth, and most have no formal address. They lack any official form of identification. This “identification challenge” is exacerbated by migration within the slum, as up to 40 percent of the population move from one health worker’s area to another every year, leaving old health records in limbo and forcing migrants to start over without any health history. In 2013 the Humanitarian Centre in Cambridge, United Kingdom, hosted a “health hackathon” that brought together health workers in international development with technologists and entrepreneurs. One of the needs they described was the need to overcome the fact that a third of all children under five have no birth certificate and no health records. The team at SimPrints took on this challenge and has since developed a possible solution. We are working on a pocket-sized fingerprint scanner that instantly links an individual’s fingerprint to his or her health records. The Bluetooth-enabled scanner allows health workers in the field to make better decisions by providing immediate and reliable access to critical medical information. A fingerprint is all it takes to find out, for instance, which vaccines someone has received and which remain to be administered. Initially, we planned to build the system using readily available fingerprint scanners, but no single scanner was sufficiently durable, portable, accurate, and low-cost. But although the solution was evident—to build it ourselves—we did not want SimPrints to become yet another “outsider” solution. So we decided to get close to the challenges, listen to users and experts, and immerse ourselves in the context in which our system would be used. Working in Bangladesh, it soon became clear that we needed to overhaul our design. Our prototype was a “swipe scanner” that requires people to swipe their finger across a sensor rather than hold it down on a “touch sensor.” Yet we noticed that many fingers had stiffened with age, after years of manual labor, and found the swiping motion too difficult. Also, the groove on our scanner that guided a person’s finger was not sufficient, and some people would swipe the wrong part of the scanner. It became obvious that a swipe scanner was not intuitive enough, requiring too much instruction from health workers to each of their beneficiaries. Though more expensive, a touch scanner was clearly essential. Had we focused on merely reducing cost, as is often the approach, we would never have developed a successful product. Our user-centered approach was singled out by the judges of the Saving Lives at Birth Challenge to reduce maternal and newborn deaths. SimPrints won a major grant for its field trials, and in 2014 we began work with Johns Hopkins University’s Global mHealth Initiative and BRAC, the world’s biggest development nongovernmental organization. We hope Nisita will soon be able to identify all her patients quickly and accurately. In contrast to the approach taken by SimPrints, almost all devices and innovations are targeted toward established markets peopled by literate users who already understand how ICTs can improve work- and lifestyle-related efficiencies. These users take for granted advanced electrical and connectivity infrastructures and are able to afford expensive technologies and utilize them in safe environments. They have also had a lifetime of exposure to ICTs and their evolution. This is not the case for people in the developing world, however, where even an “ON” button will not have the same immediate recognition as it does for someone in the developing world. When technologies developed for advanced markets are employed in poor, resource-constrained locations—where environmental conditions are harsh, electricity and connectivity are not assured, and technological literacy and understanding are scant—they fail. When Literacy Bridge explored the idea of designing a mobile device specifically for the learning needs of the world’s most vulnerable people, it began an iterative process of listening to user needs, understanding their environment, and proposing technology designs and revisions to those designs. From our earliest research, we gained an initial understanding of the problem space: the world’s poorest people are not able to make the most of their resources due to lack of access to learning new skills and healthier behaviors. Literacy Bridge also spent time in the communities to observe how daily routines related to ways in which it might use the Talking Book device both directly and indirectly. A powerful loud speaker would enhance the ability for group meetings to incorporate the playback of instructional messages for group discussion. Adding a built-in microphone to the device created significant value to users while also providing a means for collecting ongoing feedback about the program. Heavy rain and dust storms were common. The Talking Book would have to be especially durable and provide a seal over any electronic ports. Only basic carbon-zinc dry cell batteries were readily available, not alkaline batteries or those that use newer chemistries, which resulted in much lower performance characteristics. Understanding this meant designing the electronics very differently so that they would work using the batteries that were actually available. Literacy Bridge started with the assumption that the right solution would not be with the first version. By approaching product design in stages, it avoided overinvesting in a device that had not yet passed the test of large-scale user adoption. In partnership with UNICEF and ARM, 50,000 users are now testing the latest Talking Book design and Literacy Bridge is ready to invest in larger manufacturing scales to make the device the most cost-effective way to reach the world’s most vulnerable communities with life-changing knowledge. The Oxford Centre for Affordable Health Care (OxCAHT), SimPrints, Literacy Bridge, Inveneo, and USAID have all, independently, realized that technology can be much better designed to function well in the difficult conditions present across much of the developing world. For business, as much as for development organizations, this is where challenge meets opportunity. Technology with the potential to promote inclusive growth is more likely to be developed when designing specifically to meet the developing world’s constraints. It is difficult to do more than “tinker at the edges” of innovation if the comfort of the advanced world is never left and technology is designed solely for developed world conditions. Industry and private-sector technology companies thus have two distinct, important factors to consider. First, the creation of technology that meets the real needs of the developing world represents opportunities both to expand potential markets and to increase the quality of life for a large number of people.12Second, a trickle-up, disruptive innovation effect can sometimes be seen whereby a focus on designing for the developing world leads to insights and ideas that change business in the developed world too (see Box 3). The impact of the OLPC on the wider tablet market (see above) is an example of this. UNICEF needs innovative solutions to some of the key barriers it faces—such as geographical remoteness of constituents, the limited infrastructure available in these areas, the slowness of data collection, and the lack of access for the most vulnerable populations to critical information and services. UNICEF believes that the technology sector’s expansion into emerging markets can deliver expanded profit alongside social impact. However, the big corporate players and mainstream technology industries are not yet seeing this as a core business opportunity. 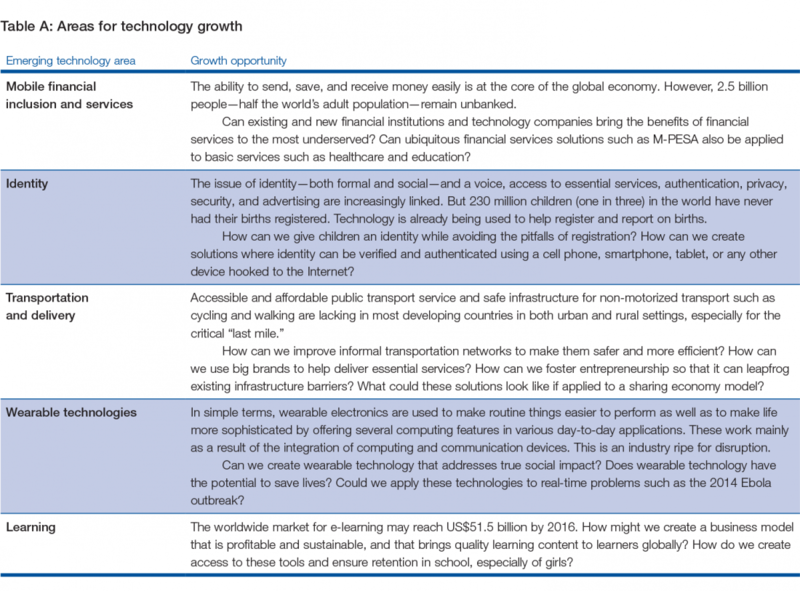 UNICEF’s Innovation Unit and ARM have identified five technology growth areas that have the potential to benefit millions of people, especially children, around the world. Table A outlines these areas, as well as the need for further research and potential exploration of these opportunities. Although all these areas are ripe for growth, challenges to adopting the technologies remain. These challenges may take the form of prohibitive cost, slow or lacking data usage and transmission, or maintaining consistent and reliable sources of power to keep devices charged. The private sector must play a key role in overcoming these obstacles. Investments must be made toward technology products and services designed specifically for the emerging markets they are trying to address. Willingness to align the corporate agenda and social agenda in concert with unconventional partnerships in the space, such as the one developing between ARM and UNICEF, will generate the new conversations necessary to move the needle on both the business and the social sides. The field of ICT4D is evolving and expanding rapidly, and ICT4D projects are taking on broader scopes and scales, expanding into agriculture, governance, healthcare, and education. But we need at the same time to ensure that the critical analysis of best practices and lessons learned continues. The quality of people’s lives and their ability to move out of poverty and live lives with increased levels of freedom and opportunity are at stake. It is a complex issue, and no aspect of it—hardware, software, or operational conditions—can be ignored. Innovations in ICT4D not only become more widely adopted across the developing world, but may even become “disruptive” technologies for all markets. It is worth noting that the explosive uptake rates of mobile phones and mobile money services in sub-Saharan Africa were unanticipated in either scope or scale.13The commercial underestimation of these markets was astonishing. Only a few hundred thousand African mobile network subscribers were expected, and M-PESA began as a corporate responsibility experiment. Are we at risk of grossly underestimating these markets again and, of even greater concern, even completely missing opportunities altogether? Imagine the inclusive growth and development that could be achieved if more commercial ICTs were designed specifically for the needs and constraints found in the developing world, rather than discovered by luck or by accident. Dalio, M. (CEO of Endless). 2014. Personal communication, September. Deloitte, GSMA, Cisco. (2012). What is the Impact of Mobile Telephony on Economic Growth? A Report for the GSM Association. Available at: http://www.gsma.com/publicpolicy/wp-content/uploads/2012/11/gsma-deloitte-impact-mobile-telephony-economic-growth.pdf. DOT Force (Digital Opportunity Task Force). 2001. Digital Opportunities for All: Meeting the Challenge. Report of the Digital Opportunity Task Force (DOT Force), Including a Proposal for a Genoa Plan of Action. Genoa, July 20–22, 2001. Report prepared May 11. University of Toronto. Available at http://www.g8.utoronto.ca/summit/2001genoa/dotforce1.html. Gerster, R. and S. Zimmerman. 2003. “Information and Communication Technologies (ICTs) for Poverty Reduction?” Discussion Paper. Richterswil, Switzerland: Swiss Agency for Development and Cooperation, ICT4D. Available at http://www.gersterconsulting.ch/docs/ict_for_poverty_reduction.pdf. ———. 2005. Upscaling Pro-Poor ICT Policies and Practices: A Review of Experience with Emphasis on Low-Income Countries in Asia and Africa. Richterswil, Switzerland: Swiss Agency for Development and Cooperation, ICT4D. Available at http://www.itu.int/wsis/docs2/pc2/parallel/up-scaling-ict-policies.pdf. Harris, K., A. Kim, and A. Schwedel. 2011. “The Great Eight: Trillion-Dollar Growth Trends to 2020.” Bain & Company Insights, Bain Brief, September 9. Available at http://www.bain.com/publications/articles/eight-great-trillion-dollar-growth-trends-to-2020.aspx. Heeks, R. and C. Kenny. 2002. “The Economics of ICTs and Global Inequality: Convergence or Divergence for Developing Economies?” Development Informatics Working Paper No. 10a. Manchester, UK: Development Informatics Group. Available at http://www.seed.manchester.ac.uk/medialibrary/IDPM/working_papers/di/di_wp10a.pdf. Hosman, L. and B. Baikie. 2013. “Solar Powered Cloud Computing Datacenters.” IT Professional 15 (2): 15–21. ITU (International Telecommunication Union). 2009. Information Society Statistical Profiles 2009: Africa. Geneva: ITU. Available at http://www.itu.int/pub/D-IND-RPM.AF-2009/en. Kraemer, K., J. Dedrick, and P. Sharma. 2009. “One Laptop per Child: Vision vs. Reality.” Communications of the ACM 52 (6): 66–73. London, T. and S. L. Hart. 2004. “Reinventing Strategies for Emerging Markets: Beyond the Transnational Model.” Journal of International Business Studies 35 (5): 350–70. OECD (Organisation for Economic Co-operation and Development). 2014. Innovating for Development: Rethinking Structural Challenges for Post-2015. Forum held in Paris, France, July 2. Available at http://www.oecd.org/site/oecdgfd/agenda.htm. Schmidt, C. (founder and CEO of Literacy Bridge). 2014. Personal communication, September. United Nations System Task Team on the Post-2015 UN Development. 2014. “Science, Technology, and Innovation for Sustainable Development in the Global Partnership for Development Beyond 2015.” Available at http://www.un.org/en/development/desa/policy/untaskteam_undf/thinkpieces/28_thinkpiece_science.pdf. van Rensburg, H. 2012. “Africa Is Rising Fast.” Techonomy, November 9. Available at http://techonomy.com/2012/11/africa-is-rising-fast/. Waugamon, A. 2014. Using Technology for Social Good: An Exploration of Best Practice in the Use of Information and Communication Technologies (ICTs) for Development. Nashville, TN: United Methodist Communications. Available at http://www.umcom.org/site/c.mrLZJ9PFKmG/b.9031619/k.4677/Using_Technology_for_Social_Good.htm. 1 Harris et al. 2011. 3 ITU 2009, p. 1. 4 Deloitte et al. 2012, p. 4. 5 For details about the M-PESA program, see Safaricom’s website at http://www.safaricom.co.ke/personal/m-pesa/nchi-na-safaricom-m-pesa. 6 DOT Force 2001, Foreword. 7 Gerster and Zimmerman 2005. 8 United Nations System Task Team on the Post-2015 UN Development 2014; OECD 2014. 10 Kraemer et al. 2009. 11 Hosman and Baikie 2013. 12 London and Hart 2004.